As the temperatures drop in Kalamazoo, a festive holiday spirit spills from the streets, parks, shops and more! Check out why the holidays are a great time to visit Kalamazoo with our must-see holiday attractions, traditions and events below. No matter your age, walking on a snowy path under bigger-than-life-sized candy canes will bring even the most hard-core Scrooge a little bit of joy! Along with the giant candy canes, Bronson Park is covered in gorgeous holiday-themed lights to admire! Walking down the Mall in the cold winter weather is a lot better when you can admire the pretty dripping icicle lights that line the street! Take a stroll down the Kalamazoo Mall during the holiday season and you can’t miss the giant waving Santa statue! If you’re not one for taking photos with a real-life human Santa, this spectacle on the Mall is the perfect photo opportunity for you! 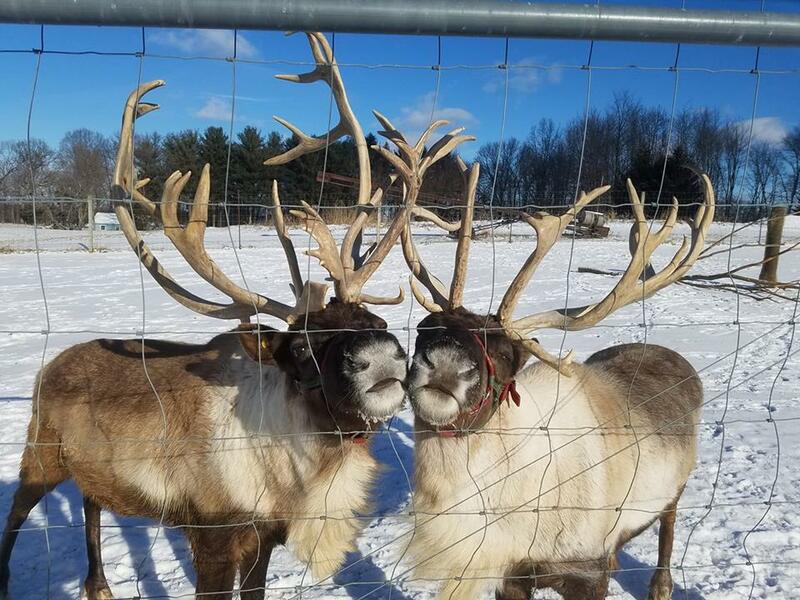 Take guided tours of the Reindeer Ranch farm with our trained tour guides. Learn about reindeer, where they are native to, how they are built for the tundra and freezing temperatures, and more. Then visit with a real live reindeer and see the rest of the herd. Residents of this 43 house street in Westwood continue a local tradition of lighting large plywood Christmas cards displayed in their front yards! A Kalamazoo Classic – The City of Kalamazoo’s Annual Tree Lighting Ceremony will once again be held at Bronson Park, the heart of Kalamazoo. The Mayor, City Commissioners, City Manager and Santa will all be on hand to read ‘Twas the Night Before Christmas’, light Kalamazoo’s Christmas trees, and kickoff another great holiday season for the City of Kalamazoo! Candy Canes, Crafts, and Santa – what could be better than that! Join the Parks and Recreation Department for the 13th annual Candy Cane Hunt on Homer Stryker Field for fun and Holiday festivities. We will have seasonally themed crafts, food and drink, and drawings for gifts for families with children 8 and under. Do you remember the excitement of visiting Santa as a child? The magic of Santa’s workshop, the anticipation of sitting on his lap and telling him everything you want on your very long list…perhaps you shed a few nervous tears!….and the letters written to Santa, the decorations, the music? Downtown Kalamazoo has a long tradition of making the best holiday memories with Santa and this year is no exception! It's a winter Wonderland at the Manor House today. Holiday Wlak & Market open from 12pm-5pm today. The Holidays are a special time of the year at the W.K. Kellogg Manor House. Each room is creatively decorated by Manor House staff, volunteers and local artists and artisans selling unique and handcrafted gifts throughout the house. Self-guided tours run from 12-5pm and are concluded by hot spiced tea and cookies. Docents are on site to offer history of W.K. Kellogg’s life, career and stories of times spent at the former summer estate. Christmas in the Village is an annual event that is FREE for the entire community. This year, there will be more entertainment, a reindeer petting zoo, more wagons for the wagon rides, the night time parade, shopping, kids crafts, and more! An afternoon of fun on the ice with jolly Ol’ Saint Nick! Enjoy holiday music and skating with the Big Man himself. Bring your cameras for this fantastic holiday photo op with family and friends!